Surface Tension features work by artists Sam Hodge, Andy D’Cruz and Marcia Teusink. The three artists share a fascination with the idea of surface tension in its scientific meaning (the elastic-like force on the surface of a liquid) and its more artistic and poetic implications (surfaces of paintings and drawings, tensions in materials, tensions between objects), and they explore these themes across multiple media. Sam Hodge’s paintings mimic the process of erosion and sedimentation to create images of emergent complexity. In his graphite drawings, Andy D’Cruz laboriously builds up layer upon layer to create a rich and lustrous surface. 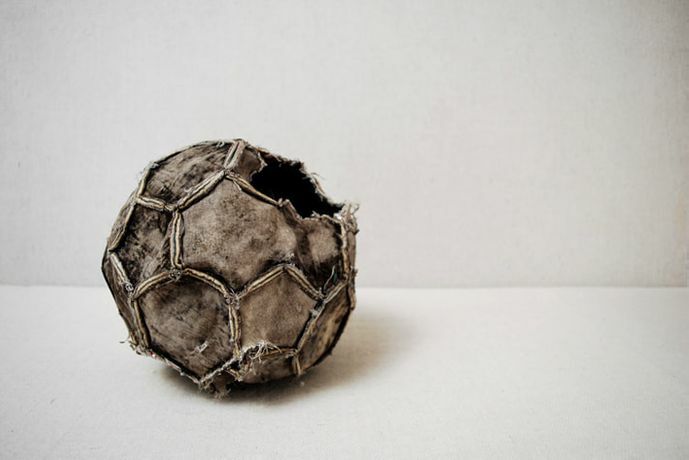 Marcia Teusink’s series ‘Fallible Forms’ features found footballs pulled out of the New River, their perfect geometrical forms altered by the water into organic, deflated and abject-looking forms. Together, these artists’ work forms a visual conversation about materiality, perception and time. For the closing event on 29 April you are invited to join all three artists for an informal artists’ talk and find out more about their individual practice, working together as a small collective and hear about what follows next.